The 2009 NCAA Men's Division I Basketball Tournament concludes with the championship game on April 6 (9:21 p.m. ET) at Ford Field in Detroit, Michigan. Mibazaar has created this Google Map showing the location of all the past winners of the championship. It is possible to sort the winners by Games Won with Max & Lowest Scores, Nail Biters, Games Won with Widest Margin, Traveled Most Miles to Win, Traveled Least Miles to Win and Traveled Least Miles to Lose. 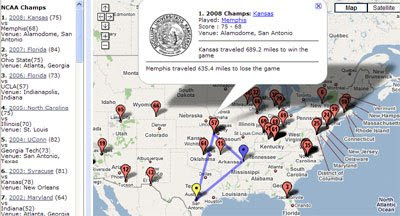 March Madness 2009 - Adam Hughes, of Google produced this Google Maps My Map of the locations of this year's 13 tournament venues in the NCAA.